Orly Cupcake is a pretty old nail polish from the Sugar Coated collection. I got it a while back but hadn’t had a chance to swatch it until now. This is a dusty pink creme with a tinge of blue undertone. It has the prettiest name. How can you resist a polish called Cupcake? In terms of application, this was pretty difficult to apply. I had to use two thick coats for opacity; this would be more like three thin coats if I had applied it properly. On a side note, I recently discovered how to create rounded edges in my pictures! 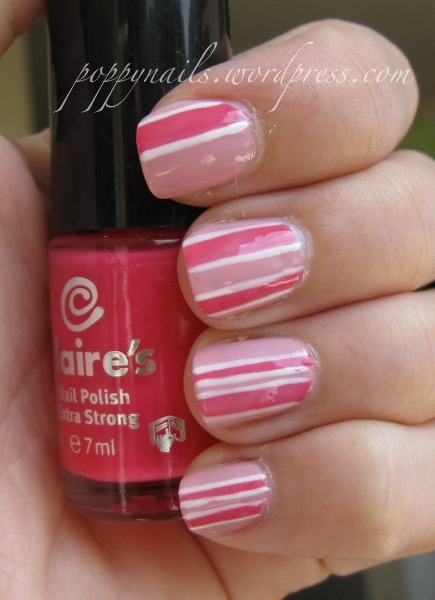 A comparison with China Glaze Something Sweet will show that Cupcake is not as sweet a pink and has a more medium tone. It also lacks the orange tone that Pop Beauty O’Boy has. Yay! Rounded corners again. Oops, I digress. This is the final look I will wear for the week. 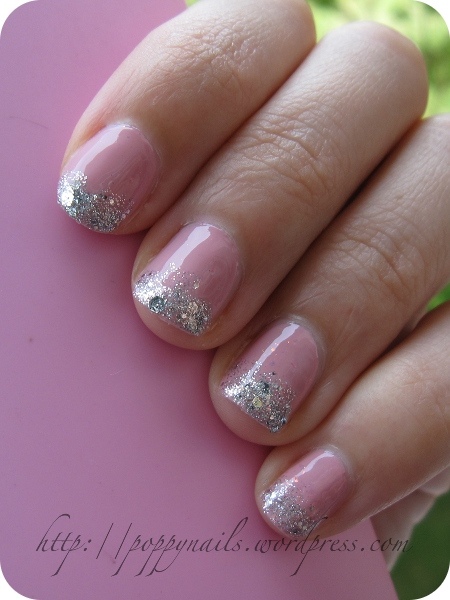 It’s a very simple pink base with silver glitter tips. OPI Crown Me Already is a great polish for glitter tips because it’s very dense and the bits are varied. I topped up with Nubar 2010 but you can’t really see it in the picture unless you zoom in. It’s for a more subtle look and I just wanted to blend everything together so that the glitter will not be so harsh. I’ve been thinking of featuring other products apart from nail polish on this blog. Yes, I know it’s called PoppyNAILS. And no, it’s because I am getting sick of polish. It’s because I don’t really like to swatch colours on myself but I haven’t had time to meet up with friends for painting sessions like we used to. Even if we meet up to paint nails, it’s usually in the evenings and I need the morning/afternoon light to take proper pictures. If I were to do product reviews, it wouldn’t be for makeup because I have the same brown eyeshadow palette I’ve kept for the past three years. I thought it would be interesting to features things that bloggers don’t normally feature. Oftentimes I’ve searched for reviews of things like L’Occitane body moisturisers but nobody can be half-arsed to write about body lotions. Understandably of course! Polish pictures we can all look and admire but it would be hard to write about scents and texture! Orly Cotton Candy is an apricot-based pastel pink creme from the Spring 2010 collection. Because of the peachy undertones, this colour is amazing for warmer skin tones like mine. Application, however, wasn’t good. I still see some bald spots with two coats so three coats would be more ideal. When swatched beside other pastel cremes like China Glaze Something Sweet and Orly Cupcake, you can see the peachy tones in Cotton Candy more clearly. 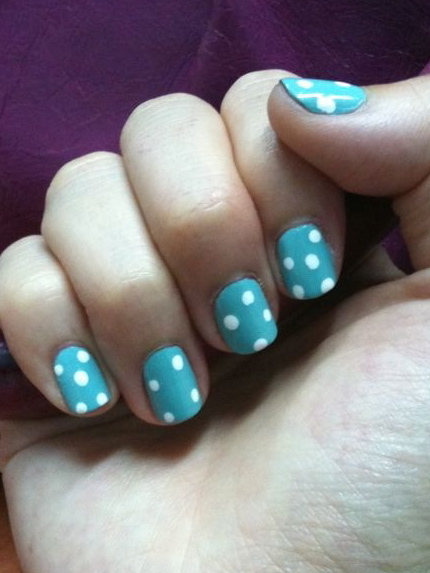 Here’s Trixy’s nails with some simple nail art – metallic polka dots at her nail tips. 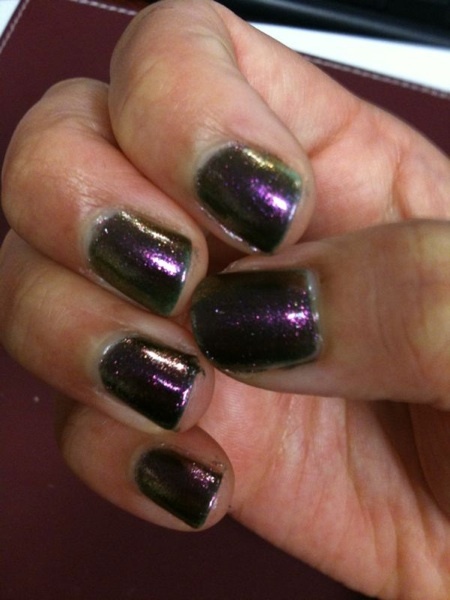 And I finally got my hands on Orly Space Cadet, the crown jewel of the Cosmic FX Fall 2010 collection! Containing a total of 6 polishes, each one of them flashes multiple glittery colours depending on how it catches the light. For Space Cadet, I see a lot of purple but there is also blue and green and pink as well. Three thin coats or two thick coats are needed to achieve opacity. 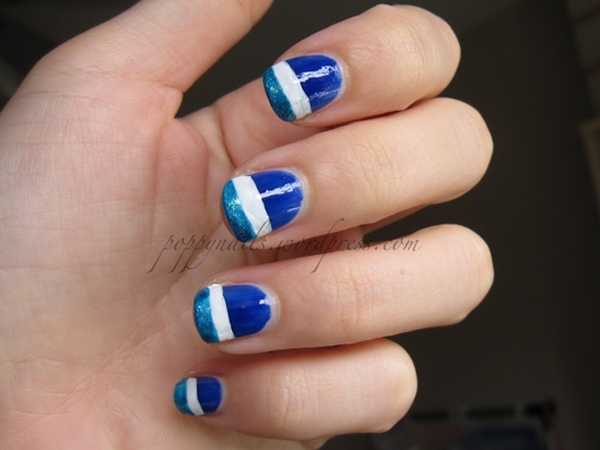 Here are some silver stripes to make the manicure look more metallic and outer space-like. I’m digging this but it’s a little too crazy for work. Liyen borrowed Space Cadet from me. A colleague said that her nails look like cockroaches! 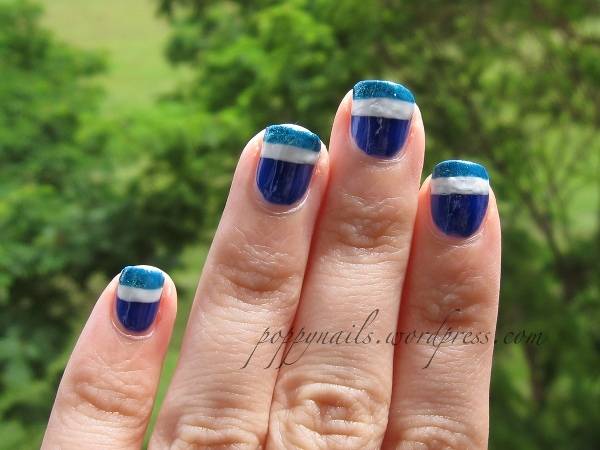 Let’s take a break from the Urban Decay Summer of Love collection and swatch one of my favourite polishes – Orly Royal Navy. I first heard about it from Scrangie. Her passion for this royal blue colour was so contagious I had to purchase it off eBay. When I first applied it, I was struck by how quickly it dried. There is some neon pigment in this, similar to the cremes in the Urban Decay collection, so it dried semi-matte. It was only after two coats did I see the micro turquoise glitter. But creme lovers, do not worry, the micro glitter is so subtle that you have to stare at your polish to realise that it’s there. 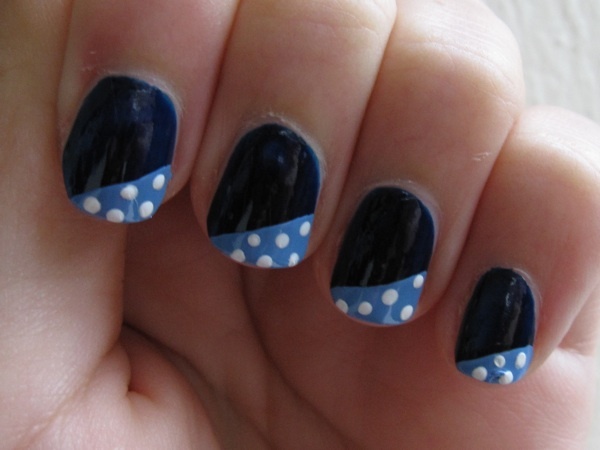 Here’s my blue pudding manicure. Okay the lines aren’t particularly straight but hopefully you will be too entranced by the pretty blue colours to notice! But Valentine’s Day, like all other festivals, is a great reason to paint nails! And what screams V-Day more than pink, white and red? Weifen received pink polka dots for Valentine’s Day. Unfortunately, the dots were a little tiny so she said they looked like measles. Seriously, if anyone wants to do polka dots, make sure you get your hands on acrylic paint because it will make your life so much easier. It’s more liquid and you can mix in water if you need a thinner formula for intricate designs. Acrylic paint is sold in art-supplies stores. Art Friend is a good place to start. Candy nails! Okay I know I called the Claire’s polish “18” but I seriously doubt that’s the right name. It’s just a number at the bottom of the bottle but since I can’t find the name anywhere, “18” it is. Essie Hi Maintenance, which is a sheer pink, is used as an overall wash to tone down the stark white lines. 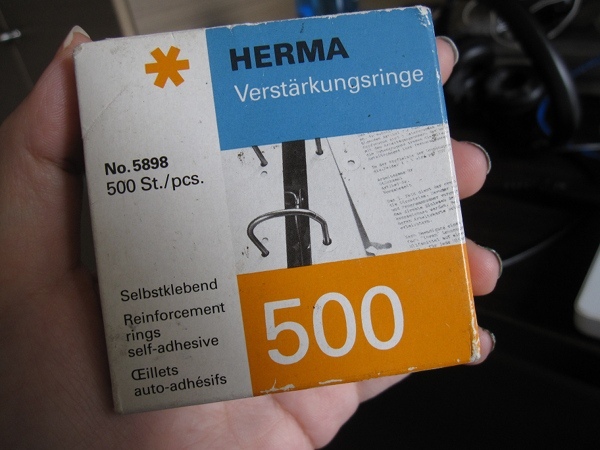 It’s extremely useful and I’ll talk more about it in another post. NARS Midnight Express is an inky blue in a jelly formula that is akin to NARS Zulu. This was re-released as part of NARS Vintage collection last year. I prefer this to Zulu. While Zulu looks black most of the time, Midnight Express is undeniably blue even when the lighting is poorer. Like Zulu, the application is somewhat uneven with only coats. Parts of the nail where I used a heavier hand showed up darker, while other parts were lighter. A third coat would have evened things out but I was afraid that the colour would end up looking black. 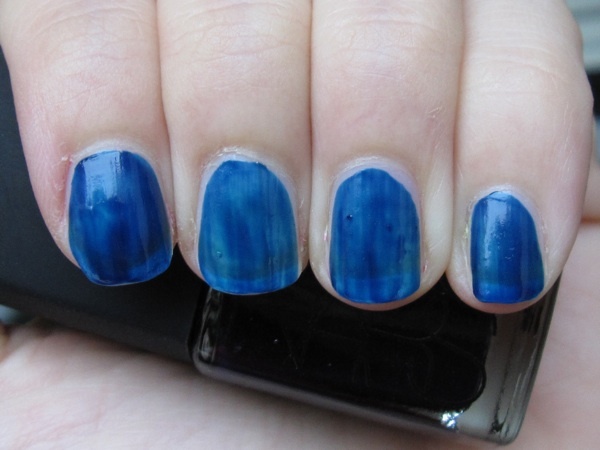 Here’s one coat just to show you how blue it was initially before I started layering it on. 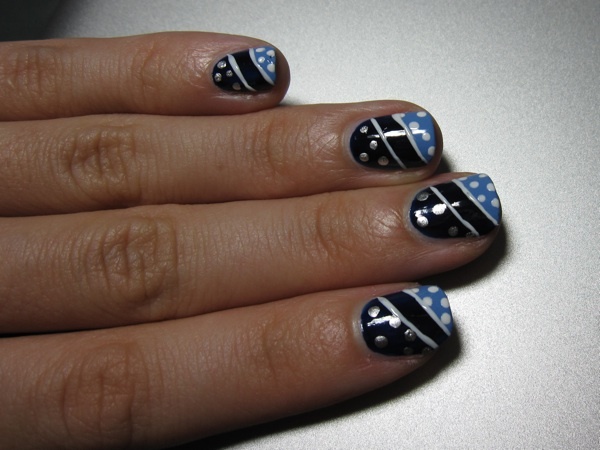 Here are some of the designs we tried with Midnight Express. The last attempt was a bit out of hand as there were way too many things going on! 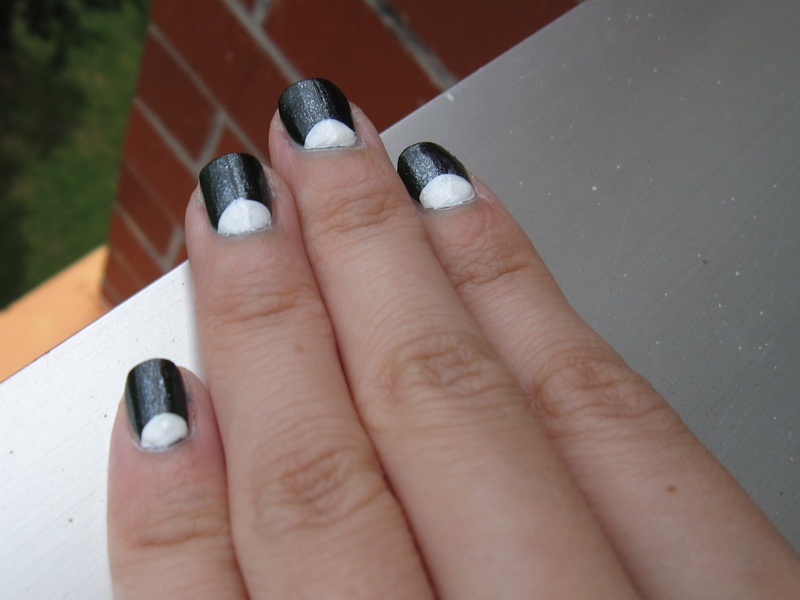 Reinforcement rings are pretty much all you need for the vintage half-moon manicure. That, and a lot of patience. By a lot, I mean if you have at least two hours to spare. 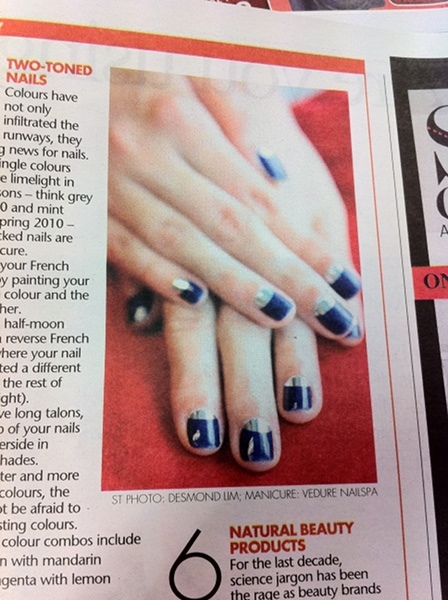 It all started with an article in Urban newspaper talking about two-toned nails. 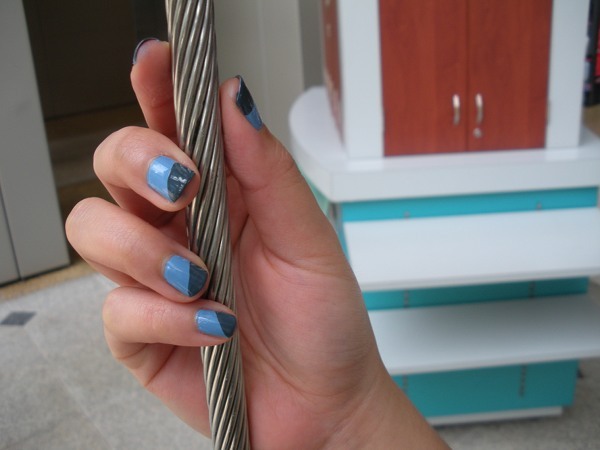 Nail aficionados will know that the real name is called the vintage half-moon manicure, which consists of painting a small portion of your cuticle a different colour from the rest of your nail. It is also sometimes called the reverse French. How hard can it be? I thought. Well, the first attempt was pretty much a disaster. I didn’t know that you had to wait for the silver to dry completely before pasting on the reinforcement stickers. When I removed them, much of the silver paint came off as well. 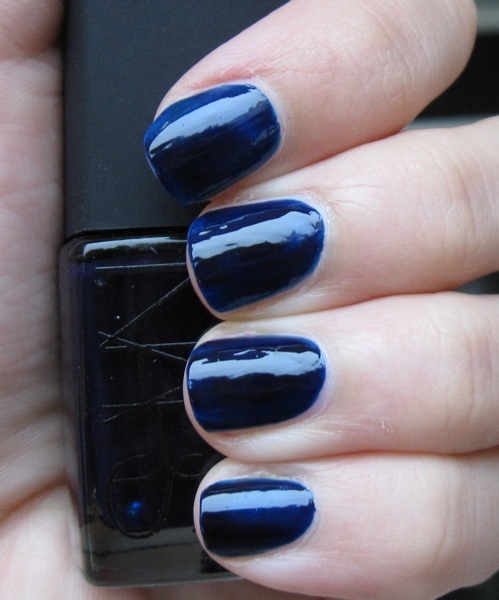 That aside, I must say that Orly Royal Navy is absolutely stunning. Maggie’s nails turned out a lot better because we had time on our side. I think this colour combination is fabulous; Black Cherry Chutney is a luxurious shimmery burgundy from the OPI India collection. But the lines separating the colours could be cleaner. Perhaps the reinforcement rings were too sticky? This is what I mean by clean lines. Cheryl handed me this magazine photograph and asked if I could recreate the look. So here’s Attempt #3. Major fail. Jagged lines galore. Her mom said that she looked diseased. We spent close to two hours painstakingly doing this and still we couldn’t achieve perfection. Can someone help? If you know the solution, it would be much appreciated. Determined to achieve the elusive clean lines and cut down on the drying time, I decided to free hand the damned moon. Here I started off with two coats of NARS Zulu. I love the way the jelly glows. It’s so shiny you can see my reflection in the nails. Using Orly Pointe Blanche, which is a white polish meant specifically for French manicures, I drew a curve line near the cuticle first, then filled in the rest of the half moon. The index finger shows the curved line. Et voila! 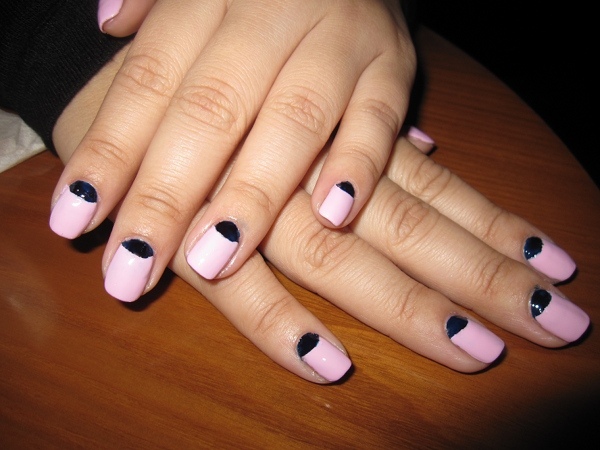 The vintage half-moon manicure without use of stickers. It’s far from perfect but at least I didn’t have to spend hours on this. Here is a closer look. My least favourite finger is the index because the white blob looks like a lump of coal. 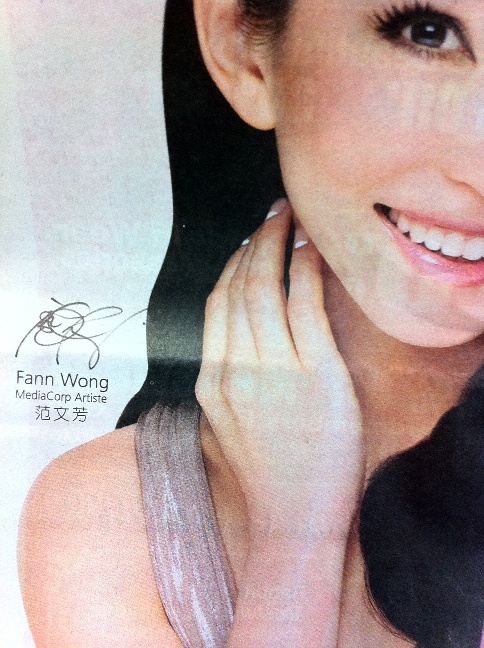 Just noticed that Fann Wong has a half moon in one of her advertisements. It looks kind of weird actually. 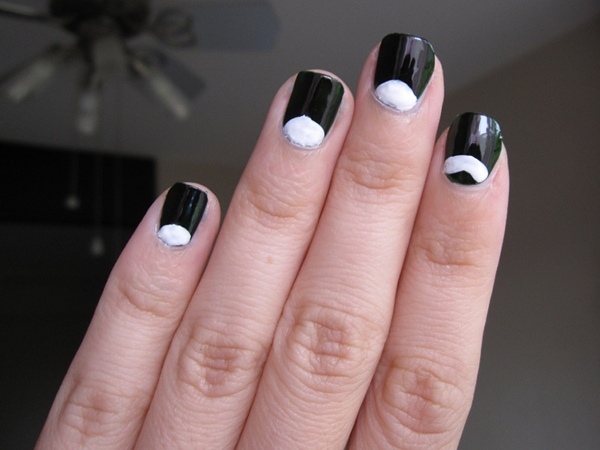 White half moon over a bare unpainted nail. Pixie Dust is a pale blue-grey with silver pieces of glitter. 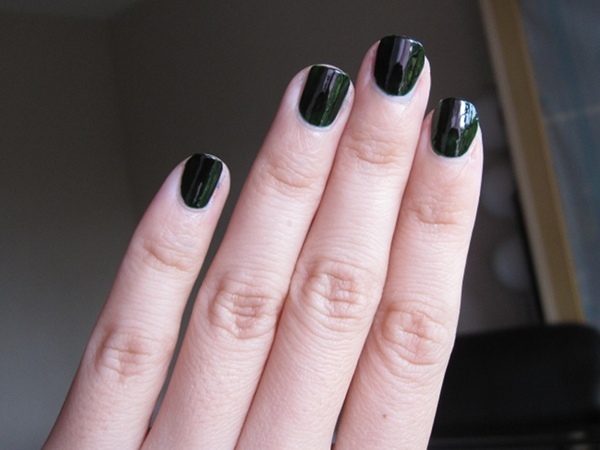 It dries kind of matte and even a top coat doesn’t make it glossy at all. This received good reviews too. Liwen mentioned that she liked the colour the more she looked at it. It was unique without being too loud. 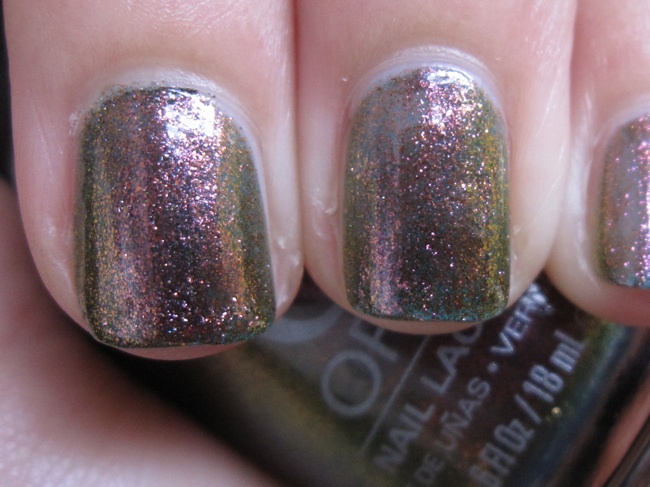 Pixie Dust is from Orly’s Once Upon A Time Collection for Fall 2009. Pixie dust shouldn’t be grey, don’t you think? This is like dust from an evil fairy. It’s also the first time my cousin Lydia is modelling for me, so that’s awesome. Unfortunately, her polish chipped within a day because she was very careless. 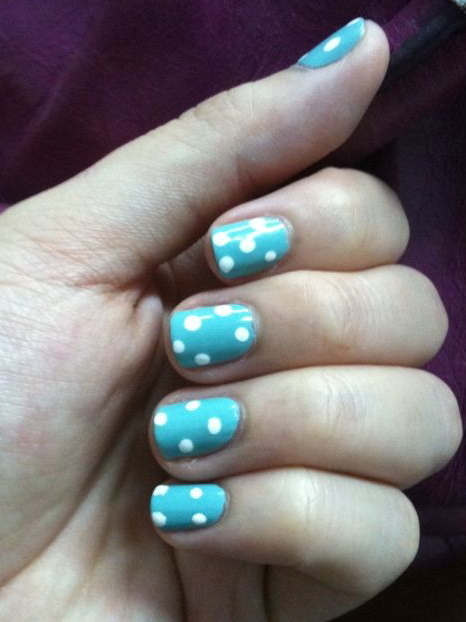 For Audrey is another one of China Glaze’s famous polishes because the colour is supposed to a Tiffany blue. It is not exact; adding a smidgen of green would make the colour more accurate. Nonetheless, it is a very lovely teal creme that is slightly easier to apply than the pastel lacquers of the Up and Away collection. I really like the third photograph. Amanda shows us her nails against an overcast sky. Cheryl has on For Audrey as well. 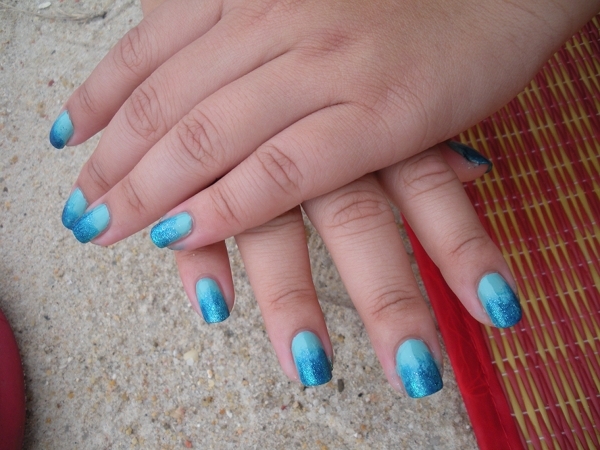 This gradient effect can be achieved by layering China Glaze Dorothy Who (a blue jelly with silver glitter) and Zoya Charla with a makeup sponge. There are water droplets on her nails because it started drizzling as Alicia was painting. 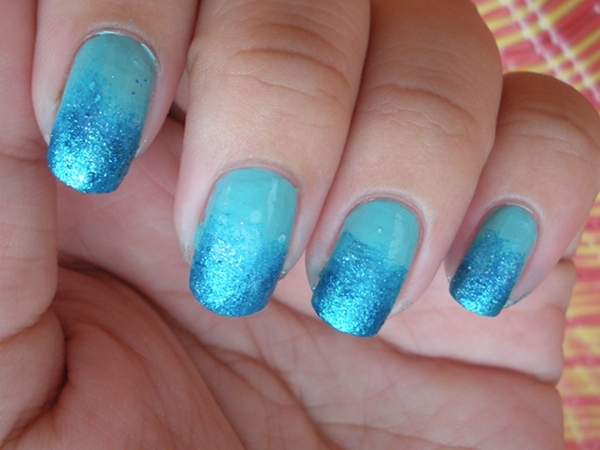 This is so awesome if you love watery mermaid looks. White polka dots make Cammy’s nails look like a blue dalmation. 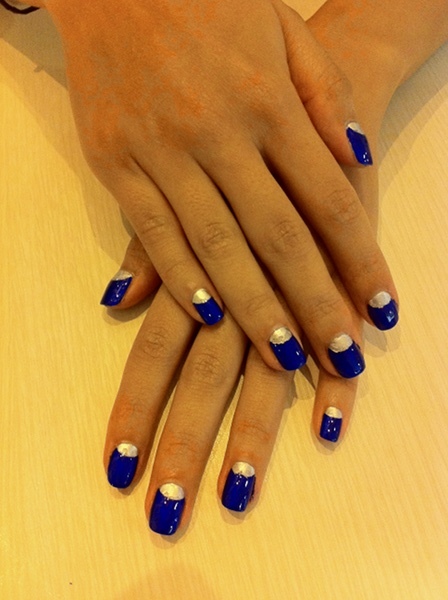 Snowcone is a very unique cornflower-blue creme shade from Orly’s Spring 2010 Sweet collection. Very thick, as with all the pastels, but the formula is better than China Glaze Up and Away range. On my toes, with China Glaze Snow Globe as a top coat. I wore this combination to work. Yes, all colours are work-friendly to me.